Swiss voters yesterday (9 February) narrowly backed proposals to reintroduce immigration quotas with the European Union. The European Commission regretted the result which it said contravened the principle of free movement of persons between the EU and Switzerland. “The EU will examine the implications of this initiative on EU-Swiss relations as a whole,” the EU executive said. While neutral Switzerland is not a member of the EU, its immigration policy is based on free movement of citizens to and from the EU, with some exceptions, as well as allowing in a restricted number of non-EU citizens. That pact on free movement of people, which came into force 12 years ago, was signed as part of a package of agreements with the EU, some of which could now be in danger of unravelling, to say nothing of the effect on a globally oriented economy that employs large numbers of foreign professionals. "This is a turning point, a change of system with far- reaching consequences for Switzerland," Justice Minister Simonetta Sommaruga told journalists in Berne. The European Commission in Brussels said in a statement that the vote went against the principle of free movement of people. It said it would examine the implications for its relations with Switzerland, taking into account the position of the government, which had urged citizens to vote 'no'. "For us, EU-Swiss relations come as a package," said Hannes Swoboda, a member of the European Parliament. "If Switzerland suspends immigration from the EU, it will not be able to count on all the economic and trade benefits it is currently enjoying. We will not allow … cherry-picking." In a nail-biting vote, 50.3% backed the "Stop mass immigration" initiative, which also won the required majority approval in more than half of Swiss cantons or regions, Swiss television said. 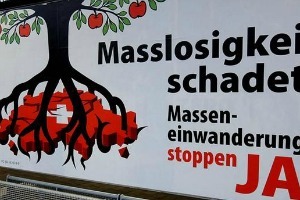 The outcome obliges the government to turn the initiative, spearheaded by the right-wing Swiss People's Party (SVP), into law within three years. It reflects growing concern among the Swiss population that immigrants are eroding the nation's distinctive Alpine culture and contributing to rising rents, crowded transport and more crime. Net immigration runs at around 70,000 people per year on average. Foreigners make up 23% of the population of 8 million, second in Europe only to Luxembourg. "This is an enormously important decision because the direction must now be shifted," SVP politician Luzi Stamm told Swiss television. "The Swiss population have said that, instead of free movement of people, quotas have to be introduced." The Swiss system of direct democracy – which allows for up to four national referenda per year – means popular dissatisfaction can be translated into action relatively easily. However, such concerns are being echoed around the EU's wealthier countries, where anti-immigration parties such as the UK Independence Party look set to make big gains in elections to the European Parliament in May. "I fear a 'yes' from Switzerland would set off a further round of debate about free movement of persons in the EU," European Parliament President Martin Schulz told the Swiss newspaper NZZ am Sonntag ahead of the vote. The provisions of the initiative require the restriction of residence permits for foreign nationals, including cross-border commuters and asylum seekers, according to quotas, the government said in a statement. These limits will now need to be defined at a legislative level, it said. Foreign professionals have helped to power Switzerland's economic success story over the past 150 years, from German-born Henri Nestlé , who gave his name to the world's largest food company, to Nicolas Hayek senior, who founded Swatch Group , the world's biggest watchmaker. The European Union is Switzerland's biggest trading partner, buying 110 billion Swiss francs' ( €90 billion) worth of goods in 2013. Opponents of the move say it could exacerbate a shortage of skilled workers in Switzerland, the home of Roche, Novartis, UBS and other multinationals filled with foreign professionals. "Explanatory and constructive talks with the EU are needed urgently," the Swiss Banking Association tweeted after the result. Swiss voters generally have a history of voting down proposals that they feel could hurt their country's economic success story or threaten its competitiveness. Last year, they rejected a proposal to cap the salaries of top executives at 12 times that of the company's lowest wage, amid warnings from industry leaders that the economy could suffer. But immigration has become a growing concern. In 2009, Swiss voters defied government advice by backing a ban the construction of minarets, and in 2010 they voted to automatically deport foreigners convicted of serious crimes. The way the EU handles the Swiss case could have wider implications, as UK Prime Minister David Cameron too has recently spoken of introducing caps or quotas for immigrants from new EU members. The Commission clearly said that this goes against EU rules and could have far-reaching consequences. The Swiss Federal Council (the government) issued a statement following the announcement of the referendum results, saying that it “interprets the outcome of this referendum as a reflection of unease with regard to population growth in recent years”. “The Federal Council will submit a proposal on its implementation to parliament as soon as possible. As the new constitutional text runs contrary to the agreement on the free movement of persons, the Federal Council will also enter into discussion with the relevant bodies of the EU and its member states, in order to discuss the next steps and open negotiations. The constitutional provisions also allow a period of three years for these negotiations. “The President of the Swiss Confederation, Didier Burkhalter, explained on Sunday that the Federal Council will explore ways in which Switzerland's relations with the EU can be put on a new footing. At the same time, however, the president stressed that the agreement on the free movement of persons and the other bilateral agreements will remain in place until a new legal status has been established,” the Swiss authorities’ statement says. European partners threatened today (10 February) to review their relations with Switzerland. French Foreign Minister Laurent Fabius described the vote, initiated by the right-wing Swiss People's Party (SVP) and opposed by the government in Berne, as a "worrying" move that showed Switzerland was withdrawing into itself. "We're going to review our relations with Switzerland," Fabius told RTL radio. German Chancellor Angela Merkel's spokesman said that while Berlin respected the result, it would create "considerable problems" for Switzerland's relationship with the EU. The European Commission said it went against the principle of free movement between the Alpine nation and the EU that has existed for over a decade. "The EU will examine the implications of this initiative on EU-Swiss relations as a whole," Commission spokesperson Pia Ahrenkilde Hansen said. Perfect! Now lets start with tight border controls around Switzerland for people and money, lets see what happens! The EU needs to respect in every way the decisions of the Swiss people – which I applaud. Equally, the EU needs to take a closer look at money flows from the EU to Switzerland and the operations of Swiss companies such as Nestle – indeed there is a good argument for much closer control of such companies – ensuring that they are the “good corporate citizens” that they claim to be. I am surprised that no-one has yet suggested that Switzerland should have another vote on the referendum proposal so that its citizens have another chance to come up with the ‘right’ answer on immigration. Isn’t that how the EU works? Or maybe threats are just the start of the European Commission and Parliament throwing their toys out of their pram because someone, or some country, dares suggest anything that is different to the old orthodoxy. “If Switzerland suspends immigration from the EU, it will not be able to count on all the economic and trade benefits it is currently enjoying. We will not allow … cherry-picking. As well Switzerland need to respect the decision of the E.U. ! What in fact want Switzerland more besides black corrupted money on its bank as well the no immigration , as well free trade! Swiss is going to far ! Or the E.U. has to show balls and restrict the free trade by 80% ! Swiss made their own politics and the E.U. ! Let’s Swiss doing all itself but then : A L O N E ! Some of the people who post here seem very opposed to a mere free-trade arrangements with the Swiss (or the UK). Yet the EU is trying to arrange free trade with the US. Perhaps someone would explain this apparent inconsistency. Why should free-trade between European countries be so bad? pcrawford has it right. The standard procedure for the EU is to firstly try to scare the heretics, then to give them the chance to get the right answer with a second vote. Although given their appalling streak of independence the Swiss might vote against the EU again, still I suppose a third, fourth etc vote could be offered. The mere idea that in this day and age an electorate should be allowed to dictate national policy to the government, what is the World coming to ? As for the comments re the origins of Nestle and Hayek, forgive me but didn’t they move to Switzerland before the current free movement structure was in place? The Swiss are not intent on stopping all movement just controlling it at a level they are comfortable with. There is a difference between the common market and free trade. The common market means companies and goods are treated the same regardless of origin, but a free trade deal essentially just removes/reduces tariffs. The EU is a customs union. Trade within such a union is without tariffs but goods from outside the union are subject to tariffs. However, there is nothing that stops a customs union agreeing a free trade arrangement with another country outside the customs union.In fact the EU has done just that with its trade deal with South Korea, and as ‘A Londoner’ suggests this is exactly the aim of the negotiations with the USA. The reality is that the EU wants to tie freedom of movement with trade for its own purposes. But in terms of simple trade there is absolutely no need for the two issues to be combined. Clearly the Swiss have decided that they do not want to link them anymore. I would agree with you, but as the common/single market is far from complete (esp in services)Then they are roughly the same. Except the common market is used as a whip to control errant members. Do anything against the EU you put yourself at risk of being exempted from the common market. Countries will soon realise this is an empty threat as the EU needs trade as much as anybody else. So there we have it EU Commissars are happy with free movement as long as their own nations are not flooded and their own young aren’t left to rot. Hypocrisy is obviously now a commission competence. Interesting MEPs have debated FGM has no one advised them its now just part of the rich vibrant multiculturalism of the EU they are all supporters of? Do you know what the word DEMOCRACY means? if the Swiss choose this option, and Europe don’t like, what we can do as europeans? The legality is say what they need to choose on the voting day? instead to have few options? Why Europe don’t ask the same to the citizens? we don’t like the fake inmigrants that are here to get a beeter life without working, the “main” inmirgants are here to work and get paid for that and then send the money to his/her country, thats Ok but not the fake inmigrants.. (look at the prisions.. they are crowned of this ones). Please EU members lets us choose qhat we need and like, not what YOU need or like. I accept that I was using the term “free market” incorrectly so I will rephrase my question. What is wrong with the EU allowing the Swiss access to the common market (and vice versa)? I understand why there is a requirement for the Swiss to subscribe to structural funds etc but why does it have to be linked to the freedom of labour? The argument about cherry-picking is relevant to full membership but does not seem relevant to non-members. The reqt to tie it in to free movement of Labour is to ensure no single grouping, ethnic or religious threatens the ascendancy of the political class who will ensure they and their scion are above such things. So wovements of goods yes but not the people ! Well the laws are not NAFTA but EFTA! I don’t understand your comment.Could you elaborate.